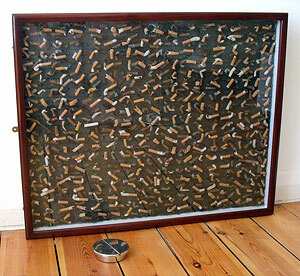 A framed length of fabric, containing all the cigarette butts collected over the course of a week from seven ashtrays in a school staffroom. It is shown alongside forensic photographs of the seven ashtrays. Since making it, smoking in the staffroom at this school has been banned.